While my wife and I have certainly been Hyatt loyalists over the years, we have started to drift away given some of the new changes to their loyalty program, World of Hyatt. Thus the Confidante in Miami is our first property from the Unbound Collection. How did this premium boutique hotel fit within the Hyatt system? The hotel is located on Miami Beach amongst some of the best shopping and food in the country. From the airport, by rental car, the drive was no more than 20 minutes, though you can save yourself some time (due to one-way streets) by ensuring you get all the way over to take 41st back to the highway. If not it can take a while to reposition yourself. We had scheduled an evening flight from Pittsburgh to start our journey and arrived at the hotel at nearly midnight. I reached out to MyConcierge a couple of days prior and requested to use one of my Suite Upgrades confirm-able in advance even though the stay would be short. I was told that reservations made using free night certificates are ineligible for Suite Upgrades in advance but she would still reach out to the property in case they had something available on the day. Albert was at checkin when we arrived and had already upgraded us to a one bedroom suite the day before we arrived. I have mentioned before that some of the shine is taken off of a benefit you have to demand in order for it to be honored, having the upgrade handled before we arrived really makes me feel like a valued guest. They also honored our request for a 4PM checkout ahead of our flight the next day at nearly 6PM. Albert at the front desk was emphatic that our suite was excellent, I got the impression it was not the normal upgrade. It’s generally an excellent sign when you know you have a suite and you walk to the end of the hallway to your room and do not have a neighbor on one side. We had room 428 on the ocean/pool side of the property. The hotel is art deco on the outside and the designers have done a fantastic job of making the hotel authentic art deco inside the property as well. The entryway to the property was spacious (perhaps to the point it was not well-utilized, but also made it feel luxurious. There is a guest half bathroom with perfect touches of the 1950s. A pedestal sink, and octagon tiles add to the ambiance. A small kitchenette and a table are to the right as you enter. To avoid writing about all of the design elements, I will allow the pictures to do the talking. While we didn’t crack anything open, the property had a well stocked minibar with medium-sized bottles of brand name liquors like McCallan 12. The room featured a large L-shaped couch, big, modern TV, and a classic wood hutch. As stated, we checked in at night so we couldn’t get a great view of the balcony but found a collection of two chairs just outside of the bedroom door, then a four-top table with an ashtray (not like a smoker would be penalized for smoking on a balcony, but it’s nice to know that they understand this will happen) and then two loungers facing the pool. Here’s the balcony during the daytime. There was plenty of room in the bedroom for the three of us. A large wardrobe held a safe, robes (identical to the ones at the Radisson Blu in Manchester but instead of £95 they were $95 each). One issue with the wardrobe was the limited space for storage. We were traveling with just two small Rimowa rollaboards but couldn’t fit either in there with it open. There was a chair by the sliding glass doors that access the wrap around balcony. The most impressive part of the room for me was the desk. It was simple, the right size, had enough space for a pair of laptops and was both classic and modern. Why I don’t have a photo of that, I have no idea. In the same excellent art deco style as the guest bathroom, this one offered a modern rain shower head and large Joseph Adler amenities though they were not available for removal from the room (unless you would like to buy the 8 oz bottle for $20). There were still hinges on the mirror from when it would have been used as a bathroom cabinet cover which suggests to me that some of the pieces used in the hotel are original and authentic. As a Globalist, included breakfast for my party (up to two kids and two adults) are a favorite program perk from Hyatt. The brand really does a nice job with the most important meal of the day and you don’t feel like it’s run of the mill at any full service Hyatt, but at some of the more designer hotels in the chain, breakfast can be a true differentiator. Eggs Benedict is a Hyatt flagship menu item and the key is how they vary it for the hotel’s particular market. This one featured (nearby) Alabama white BBQ sauce instead of hollandaise and fried green tomatoes – I was happy I’d ordered it. Lucy had a little bit of a sniffle and the server brought by some lemon tea and honey which Lucy liked to add to her cup as much as she liked drinking it. 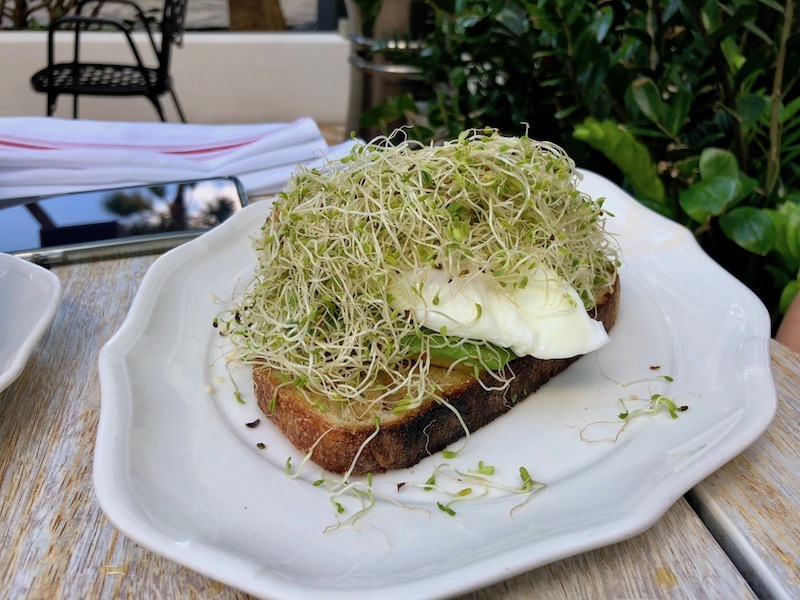 Lucy had a waffle with fruit and sausage (bacon was brought out by accident then replaced), my ultra-trendy wife had the Avocado Toast with a poached egg and “too many sprouts”. Everything was tasty and worth the wait for a table outside (about 15 minutes). There is a house coffee shop next to the waiting area and they make sure each shot of espresso is also coffee. More on that later. There was ample seating inside for those in a rush that do not want to wait, along with a buffet that we found to be just okay. We would rather wait for a seat outside and another 20 minutes for our menu breakfast items than the quick service for a mediocre offering. This is pretty much the only thing about the property that was mailing it in, if you are a Globalist, just order off the menu. In tropical south Florida, this is the extent of fruit on the buffet. It was at breakfast that we would encounter the venerable Tennis Skirt. As seen from our balcony just a couple of floors above, there are two fantastic pools. While they were not marked “Family pool” and “Adults-only”, there was clearly a cultural divide which made everyone more comfortable. That divide was easy to spot, in fact it was fluorescent. The Confidante left some large pool inflatables in the water of both pools for the enjoyment of the guests. During the day kids had moved most of them to one pool over the other. While I am sure Spring Breakers would love to take some Instagram photos on the giant white goose, it would have probably gotten old fast with the little kids grabbing the wings because now it’s their turn. Instead, Lucy (and the other children) shared the inflatables in one pool while the adults sipped libations and chatted at the other pool. It worked well for all involved. There was a third, separate, water feature in the shade where many were working on laptops. This was also near the 1930s house which featured a bar and game area. There were large versions of Jenga as well as table tennis with swimsuit clad teenagers having a great time outside of the pool. It looked every bit the part of a postcard from a bygone era attracting northerners to Miami Beach for family fun in the sun. Pools are nice and all, but this is Miami Beach and we were happy to walk a short distance exiting the pool area to the sand. Our room key card worked to get us back into the pool area when we returned. Miami Beach is absolutely public, but I quickly got the impression that a majority of the beachgoers at this particular part of the beach were hotel guests. There are a couple of outposts of The Confidante and staff members everywhere. They have a towel station, chair rental, and serve food and drinks from the hotel restaurant all the way to the waves if you like. The property also provided sand toys for guests and Lucy loved it. We couldn’t determine where our car would go when we handed the keys to the valet and I suspect that parking nearby would be a struggle generally. Calling down ten minutes ahead of time was sufficient, though the property does share valet staff with three other nearby hotels (at least in the evening) so allow ample time when calling for your car. As we were staying on essentially a points stay, we were not charged for valet so we didn’t have to come to terms with the staggering $44/nt plus tax. In Washington DC at the Park Hyatt we paid $50/nt which seemed fair, but for some reason it seems so much more expensive here. The airport is about 10-20 minutes drive if you would prefer to grab a taxi or Uber. Make no mistake, we loved this property. Lucy was asking when we could go back right after we left. Service was excellent from checkin upgrade master Albert to our server at breakfast that had the good sense to bring lemon tea and honey for our daughter. The food was really good at breakfast and looked good as it passed by us at the pool (we weren’t hungry but others were and we didn’t see anything that we wouldn’t have ordered ourselves). The pools themselves were great, if you wanted a private experience go early or later in the day, the party is busiest during the middle of the day. The beach was breathtaking too and it doesn’t get any closer to the water than The Confidante. Lastly, the rooms and general decor were excellent and premium, we can’t wait to get back to The Confidante and explore the rest of the Unbound Collection from Hyatt. Have you stayed at The Confidante Miami Beach? Are other Unbound Collection hotels this perfect? Great review. Only quibble I would have is as a lifelong Miami Beach resident, I do not think anyone would describe the location of this hotel as South Beach. Absolutely agree. I must have been googling something regarding South Beach while typing the post. It happens more often than you might imagine. Edited. Your daughter’s Wonder Woman swimsuit is very cute. Thanks for this review, I live in Miami and wasn’t aware of this property although I have undoubtably driven by it numerous times. Thanks, she loves the suit. We all loved the property – you might consider a staycation, especially you have status with Hyatt and get breakfast for free! I love the hotel. Check out the Dua Lipa, New Rules video filmed there too. I had heard about that but hadn’t seen it. It really shows off the hotel, but to be clear, there are no flamingos roaming the premises. We have been there 2 years ago also as globalist even with a suite upgrade voucher, so not a real upgrade by the hotel. But unfortunately there was a suite assigned to the Collins Avenue with no balcony at all. Near the elevator. Only after clear complaint we fit a nice room with a balcony. Not a suite. They said none would be free for the whole stay of 4 or 5 nights. Although we have booked many months in advance. This was a bad experience in the beginning. The breakfast was really good but not that excellent as described here on the pictures. So to summarize, it seems the hotel made a quality improvement during the last 2 years. Hopefully the room assignment was not only made due to the globalist status but to the well known guest as an excellent writer. This hotel was previously the Thompson Miami Beach. The majority of the design elements are from Thompson when they debuted the property in December 2014. It was then abruptly sold to Hyatt in 2016. It still certainly looks more like a Thompson hotel than a Hyatt. BTW…Thompson just announced a new-build hotel set to open in 2020 in Miami Beach next to the convention center, not too far from this property.